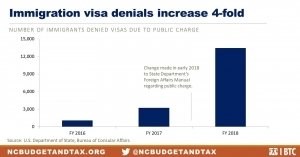 New data released by the U.S. Department of State show a significant uptick in the number of visa denials on grounds of public charge compared to data from prior years. These data, in addition to the public charge rule change proposed late last year, demonstrate the Trump administration’s commitment to restricting immigration, particularly for families accessing critical resources. While the public charge rule has existed in some form for more than 100 years, its current definition took effect in 1999 and is based on the likelihood that someone will become a “public charge” by using certain public benefits for which they are eligible. Experts agree that the departure from previous data on visa denials is likely due to a revision made in early 2018 to the State Department’s Foreign Affairs Manual (FAM), which instructs U.S. consular officials on granting visas to immigrants and non-immigrants who are abroad and seeking to enter the U.S. The new manual language imposes stricter rules about use of public benefits, income levels, and proof of financial support from family. 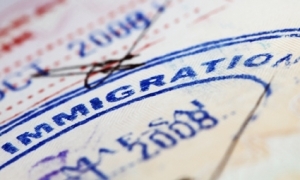 This change came as part of a response to a 2017 White House Memorandum prompting increased vetting of visa applicants and others seeking entry into the United States. While the FAM governs persons who are abroad and seeking to enter the U.S., the proposed public charge rule that is currently being reviewed at the federal level impacts those who are already inside the U.S. and are seeking to obtain a visa or green card. The increase in denials based on public charge for visa applicants outside the U.S. could be a bellwether of what would happen if the proposed public charge regulation were to go into effect for applicants inside the U.S.
News about this dramatic increase in visa denials, along with confusion and fear about the current proposed rule, could have a chilling effect on families accessing the programs they need to make ends meet. It can also thwart our country’s vision of ensuring people in need can live in a country that respects and supports their well-being. The historic Immigration and Customs Enforcement (ICE) raids this week were not a fluke — they were a direct result of refusals in urban North Carolina counties, like Mecklenburg, Wake, Orange and Durham counties, to work with the federal agency. ICE Atlanta field office Director Sean Gallagher told reporters Friday morning that the more than 200 people arrested this week across the state is “the new normal.” He said specifically that the decisions in Mecklenburg, Wake and Durham counties to end their 287g programs — a voluntary partnership to help ICE with immigration enforcement — led to agents having to actively seek undocumented immigrants there. “This is politics over public safety at its worst,” he said at the press conference, which was reported on by several media outlets across the state, including the Charlotte Observer. Durham Sheriff Clarence Birkhead and Wake Sheriff Gerald Baker could not immediately be reached for comment. 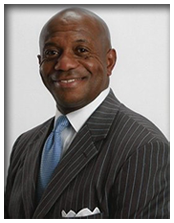 Mecklenburg County Sheriff Garry McFadden said ending 287g, which he did on the first day he took office, was not political for him. He’s passionate about fighting for the people who can’t fight for themselves. “The problem with ICE is they want to make it seem like I don’t want to prosecute crimes,” he said, explaining how his law enforcement background contradicts that (he worked homicide cases for 22 years). McFadden said he believes ICE’s actions this week have been in response to his agency sending them new policies and procedures in the wake of ending their 287g agreement. ICE agents are still welcome in Mecklenburg’s detention center, and they still have access to the information local law enforcement has access to, but McFadden said he’s not going to have his employees do the federal agencies job for them by housing undocumented immigrants who are otherwise supposed to be released. He pointed out that he doesn’t have anything to do with releasing someone from a facility — bail is set by judges, magistrates and prosecutors. ICE held the press conference in McFadden’s county while he was attending a conference in Washington D.C. He said it was meant to get people into an uproar, but he will continue to stand firm. His office also implemented a policy requesting ICE notify them when they show up at the county courthouse so that deputies could monitor their actions. That was done after some ICE agents came into the courthouse, hid their badges and pulled hoodies over their head and mingled in a hallway until a defendant they were looking for came out of a courtroom. The defendant was wearing a suit and tie and was bombarded by the agents, who didn’t identify themselves until they were asked several times who they were. McFadden said he has no qualms with helping ICE when they are protecting all communities from violent crimes at all levels without targeting just one demographic. He’s focused on reform, and he will continue to stand for change for future generations regardless of ICE’s apparent retaliation. “In order to be different, in order to bring justice, in order to bring awareness – and it’s something all great leaders have done – you have to stand firm, you have to take the beatings,” he said. And there could be more ‘beatings’ to come. Gallagher said ICE will continue their enforcement efforts and won’t turn a blind eye to other undocumented family members or friends in the wrong place at the wrong time during targeted operations. He said they conduct operations at courthouses, during traffic stops and at the homes of people they believed to be undocumented immigrants. Until the press conference Friday, ICE officials had refused to give any specific information about the raids being reported across the state. The raids, according to Gallagher, were unrelated to the undocumented individuals arrested at a gun manufacturing plant Tuesday in Sanford. Of at least 200 of the other immigrants ICE arrested this week, nearly one-third taken into custody are what the agency calls “collateral:” immigrants who are living here illegally but lack any kind of criminal conviction or pending charges, according to the Charlotte Observer. Gallagher said 50 of those 200 taken into custody had prior criminal convictions — though he did not say for what types of crimes — and 40 had pending criminal charges. Another 50, he added, had re-entered the country illegally after a prior deportation. About 60 were individuals who weren’t targeted but who were in the vicinity during raids. Another urban area he criticized in the press conference was Orange county, although Sheriff Charles Blackwood doesn’t really understand why — they never participated in a 287g program. He said ICE is going to do their job, and the only thing Orange County won’t do is honor their detainers, because they don’t have the authority to enforce federal law. Detainers are documents that essentially ask local sheriffs and jails to hold on to undocumented immigrants for ICE even if they’re supposed to be released on the local level. The documents aren’t orders and they’re not signed by judges — they are requests from ICE. Blackwood said ICE is one of the largest law enforcement agencies in the country and have plenty of people to do their work without asking sheriff’s and counties do their jobs for them. McFadden said there are still a number of ways in which his agency works with ICE, including sharing fingerprints, honoring criminal warrants signed by judicial officials, verifying individuals’ legal status for felonies and impaired driving offenses and notifying the federal agency about criminal ICE warrants. Gallagher’s insinuation, he said in a release, that dangerous people were walking out of jails because of the end of 287g programs is engaging in cynical fear mongering. In a phone interview, he compared ICE’s press conference to a gnat, and said he would still go about doing his job the way it needed to be done without being bothered by it. In case you missed it, voters in several North Carolina counties sent a strong signal this year that they don’t want local law enforcement to do the dirty work of enforcing the Trump Administration’s immigration agenda. Sheriffs elected in several counties have pledged to stop honoring immigration detainers and declared an end the controversial 287(g) program, which essentially makes local officers extensions of the federal Immigration and Customs Enforcement (ICE) agency. One anti-immigrant policy emerged as an important factor for voters in several sheriff races. The 287(g) program allows a local law enforcement agency to deputize some of their officers to act as immigration agents and to hand undocumented constituents over to ICE, even in circumstances when there has not been a conviction. This policy undermines trust between law enforcement and the community, which can result in less crime being reported due to a fear of deportation. Voters in Mecklenburg County delivered a rebuke to the 287(g) program as Garry McFadden won over incumbent sheriff Irwin Carmichael, who defended the use of the anti-immigrant policy. During his time as sheriff, Carmichael re-signed the county’s 287(g) agreement and the total number of people processed for deportation through the program reached over 15,000. McFadden announced the end of the program this week. In Wake County, Gerald Baker unseated longtime sheriff Donnie Harrison, who was running for his fifth term in office. Under Harrison’s leadership, Wake County became one of six counties in the state to participate in the 287(g) program. Harrison had been strongly criticized for choosing to participate in the 287(g) program that separates families and increases racial tensions in the community. In stark contrast, Sheriff-elect Baker pledged to end the partnership with ICE as soon as he takes office, a stance that clearly resonated with voters in Wake County. Durham County saw a similar outcome in the primary race for sheriff as Clarence Birkhead ousted Mike Andrews. Birkhead, the first black sheriff of Durham County, pledged his office will not honor immigration detainers, which are requests to hold a detainee for up to 48 hours beyond the time they would have otherwise been released. ICE detainers requests are not obligatory and sheriffs have the option to honor or ignore an immigration detainer. Earlier this year, Andrews chose to publicly reject a request by community members to stop honoring ICE detainers. During Andrew’s time as a sheriff, Durham County honored thousands of ICE detainers. 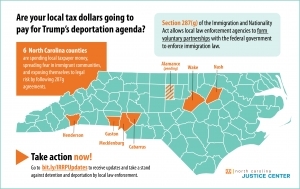 Collectively, these results signal North Carolinians’ growing opposition to aggressive immigration enforcement policies emanating from Washington, and a refusal to see their local law enforcement used as pawns for the Trump Administration’s agenda. The Trump administration is once again attempting to restructure a longstanding policy in U.S. immigration law. Last week, the administration published a proposed change to the public charge rule in the Federal Register, setting off a period of public comment. Under the proposed change, an individual deemed a public charge may be disqualified from adjusting their status to a green card or obtaining certain visas. The changes will place greater emphasis on income and penalize people for accessing programs that they are eligible for to help them make ends meet. Following a track record of putting money over people, this Administration seeks to punish low-income working people and families. Under the proposed rule, a public charge assessment will consider federal public benefits such as SNAP (also known as “food stamps”), non-emergency Medicaid, Medicare Part D, and housing assistance. Since the assessment measures the totality of circumstances, other factors considered are age, ability to work, health history, education, and financial status.